Together they own and run Almaz Media. With our support, Hanoi-based documentary maker Vincent Baumont made ‘Red Over the Rainbow’. Isaak has been working on documentaries, TV shows and commercials for the last ten years. 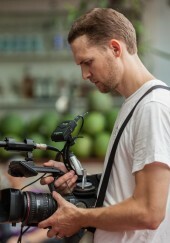 His experience in Canada, Brazil and Denmark led him to work on major documentary productions in Vietnam and to found Almaz Media with Vincent Baumont. Prior to that he completed a Master’s degree in International Development and European Studies. He presented two papers (based on his thesis on civil society and the Internet) in Denmark and Canada in 2008: ‘Revolution 2.0’ and ‘Social Movement 2.0’. After he completed a Master’s degree in video from the l’Ecole Nationale Supérieure des Arts Décoratifs in Paris, Vincent Baumont completed a year-long commission from the French Ministry of the Environment to raise awareness of systemic soil erosion throughout France. He then moved to Vietnam to co-found Almaz Media in Vietnam, where he has over five years’ experience in directing, filming and designing documentary and feature films in Europe and Southeast Asia.